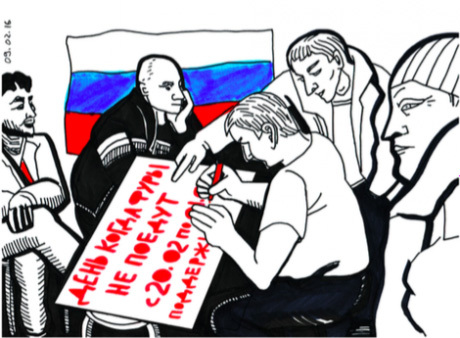 Our story on Russia’s grassroots activism continues. From Moscow’s parks to federal highways, ordinary citizens learn the power of protest – and of solidarity. On 1 March the toll per kilometre for federal highways was supposed to double, from 1 rouble 53 kopecks to 3 roubles 6 kopecks. The activists at the Khimki camp decided it was no use just standing around the camp and holding regional meetings, began to organise a national truckers’ strike. The protesters believed that toll roads for trucks would be just the start. The toll would ruin the existing transport system and only the large monopolies would be left. I made a poster for the strike, with a list of cities that had already had trucker rallies, pickets and strikes. Long distance truck drivers rarely use the internet, and protests are never shown on TV. Most of the drivers I managed to talk to at truck stops supported the Khimki activists. “Yesterday we handed out flyers in the car parks. There are still many truckers who don’t know about our camp at Khimki” says Aleksei. A return of concessionary public transport fares for disabled people and pensioners in all regions. “These have to be the key demands because these issues affect everyone”, the truckers explained. “Everyone will grow old; everyone has parents”. Before the strike the truckers at Khimki also held meetings in various cities, to share their experience of self-organisation. 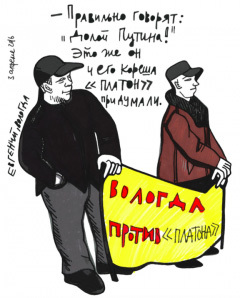 “In the regions it’s the Khimki truckers that people want to see – they trust us”, said the activists. But there was no money to continue these visits. The toll per kilometre hadn’t increased. According to the activists at Khimki, 50-60 regions took part in the strike. In Dagestan 90 per cent of drivers joined in (the supermarkets got ready for it in advance). Temporary protest camps were organised in St Petersburg, Nizhny Novgorod, Vologda, Tyumen, Khakassia and Orenburg, and a new temporary camp was set up at Tyoply Stan on the outskirts of Moscow. “We’ve managed to convince many truckers to join our strike. There’s nothing to lose”. Most TV stations ignored the strike. Maksim, a trucker from the Khimki camp spent two days at the new camp in St Petersburg. “There are the same number of trucks as in Khimki. The drivers are mostly locals. There were some truckers with slogans, ‘Down with the government’. Then they left and it was just normal people”. The union had 60 members in St Petersburg before the strike, and about 300 afterwards. The truckers were also able to take part in a memorial march for opposition leader Boris Nemtsov: “when they started calling us a ‘fifth column’, we realised how easy it was to drag anyone’s name thought the mud”. After meeting some of the Torfyanka activists the truckers paid them a visit at their camp and realised that something needed changing in Russia, and that they needed to join forces. “We already baptised them. And beat them up. It didn’t make any difference”. Darya also tells me about attacks on local activists by men from Forty Forties and the lack of police response to this. “I’m a believer”, she says, “but I’ve stopped going to church. I won’t have my children baptised either – they can decide for themselves when they’re old enough. And of course I’ll tell them the story of how we saved the park”. The Torfyanka residents who were on vigil that day invited me into their tent. It was a frosty day and after 20 minutes my hands and feet were numb with cold. In the winter the “shift” lasted three hours, and people tried to keep warm with the help of blankets and cups of tea. A woman who everybody called Auntie Valya called by with trays of pancakes and tarts. ”The people here were those who supported the Maidan, all kinds of Radio Liberty types… for some reason they were considered to be local residents” says Kormukhin. A banner nearby says “more churches, the fewer gays”. “We used to be strangers to one another”, the activists said, “but now we’ve become friends. We’ve started meeting up and visiting one another. And we’re more involved with our neighbourhood: we’ve managed to get the council to repair the roads, put new lifts in the blocks of flats and even paint the entrance halls”. The Forty Forties movement has continued to organise prayer meetings in Torfyanka, still angling for the construction of the new church here. 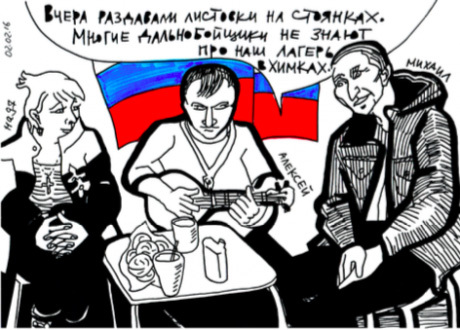 The drawing shows one of its leaders, the composer Andrey Kormukhin, making an inflammatory speech while processing round the park with his followers. He also asked them to pray for Orthodox activist Lyudmila, who was put under house arrest for defacing several works by the well known modernist sculptor Vadim Sidur (1924-1986), sometimes referred as the Soviet Henry Moore, at an exhibition in the Manege, Moscow’s premier art space. “Fight the persecution of Orthodoxy”, shouted Kormukhin. Forty Forties was due to hold another rally on 13 February. But on the night before, some of its members attacked the vigil tent. In response, the activists phoned the truckers, who immediately came to their aid. The rally nevertheless went ahead the next day. A large crowd of local residents, furious at the night time attack, also gathered, and blew whistles and sang the Internationale to drown out the speeches and prayers. The police formed a human chain and put up a fence to separate the ROC activists and the locals. In March the Torfyanka conflict was joined by another one over a different Moscow park. Residents of the Timiryazev District complained about the proposed construction of a 22 storey residential building with an underground car park next to Dubki Park, on the site of a former nursery school and the avenue of oaks that gave the park its name – “dub” is the Russian word for oak. 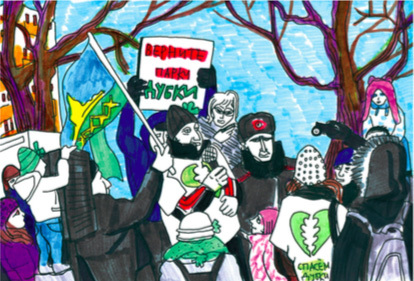 On 26 March the residents held a protest under the rallying call, “Let’s save Dubki!” The park railings were hung with children’s drawings, produced for an “I Love Dubki” competition. Many locals came with their children, presumably kids who had taken part in the competition, and enjoyed looking at the drawings while waiting for the speeches. There were also old songs from the Soviet years playing on the PA system and I could hear some elderly women reminiscing: “there used to be small wooden houses here and a grove of trees with nightingales nesting in them”. A few activists from Torfyanka came to support the protesters, as well as people who had tried to save the Druzhba (“Friendship”) Park, where a stadium is now being built. 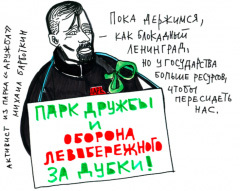 Mikhail Barbotkin, one of the Druzhba activists, spoke about how security firm employees would attack at night, so they always needed some men on the vigil “night shift”. After the rally I asked Mikhail how they had defended themselves at Druzhba, and he told me about serious fights between the security guys and the residents, with injuries on both sides. The speakers at the rally included Sergey Mitrokhin of the Yabloko Party and people from a few other political organisations, but the crowd showed no enthusiasm for their speeches. A statement from one of the “Let’s Save Dubki” campaigners: “We don’t need politics. We have a concrete issue here”, was however met with applause. After the rally I met Dmitry, one of the main activists holding the vigil along the construction company’s fence. At first the vigil only took place during the day, and the campaigners went home at night. But one day the residents looked out of their windows, and the trees had gone. The construction people had felled the entire oak avenue overnight. While I drew his portrait, Dmitry told me about his parents, who lived in a barracks building on this street, and his granddad, who went off to to fight in World War II from here. “This is my history that they’re trying to take from me”. Dmitry believed that by the end of the confrontation he would have a lot of protest experience behind him, and that after a victory at Dubki he could help people trying to save other parks: “I also want to say ‘thank you’ to the construction company for introducing me to my wonderful neighbours”. “On the barricades”, as well as Dmitry and some other activists I met some very small “vigilantes”. Brother and sister Albert and Nargiza live in the next district, and came on the protest by accident when they came for a walk in the park. Albert had already read about the “Save Dubki” campaign on social media, and the children decided to join the vigil. “I phoned my Mum, and she was happy about it”, he told me. On 31 March the residents were unable to stop the construction firm bringing its equipment onto the site. Several locals were injured in confrontations with security company staff and some were taken to hospital, while about 15 were detained at the local police station. 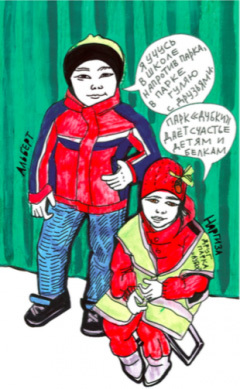 “I go to the school opposite the park and hang out there with my friends” says Albert; “Dubki Park makes children and squirrels happy” adds his sister Nargiza. 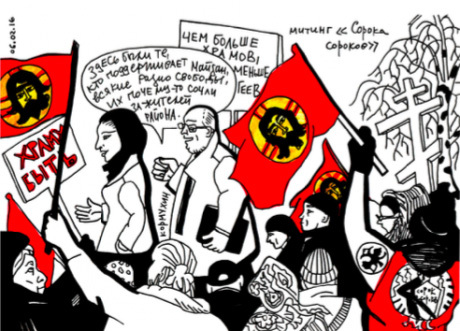 In early April an anti-Plato rally, involving PARNAS, Democratic Choice, Yabloko and the Communist Party was announced. The Khimki truckers and their regional allies, however, decided after a Skype vote not to take part. Among the speakers were Ilya Lvov, the chair of Democratic Choice’s St Petersburg Branch and Svetlana Stosha, the director of a transport firm as well as chair of the alternative Road Hauliers’ Union. Both of these have regularly criticised the Khimki protesters on social media, for their, as they believe, mistaken protest, which they see as “compromising with the parties in power” and “wrecking and betrayal”. The head of the Interregional Drivers’ Union Aleksandr Kotov and the chair of the Miass branch of the Union of Professional Drivers Nikolay Matveyev spoke out in support of long distance trucker Aleksandr Zakharov, given a nine year maximum security sentence for alleged murder despite insufficient proof of his guilt. At the rally I bumped into Yevgeny, a trucker from Vologda whom I had met at the Khimki camp. He told me how the strike had gone in Vologda: “Between 20 February and 1 March there were 25 trucks parked at the camp. For the first two days the police were giving us serious grief, and tearing up our placards. They charged the truckers with various offences and threatened us with fines. During the strike, three drivers left the Plato system”. The activists at the Khimki camp were dismissive of the Vologda truckers’ contribution to the rally, for which they were criticised. 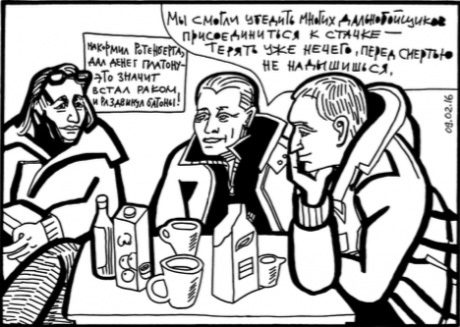 “Politics and life are dirty”, some of the Vologda guys complained. “You want to stay clean, is that it? What difference does it make who unites with whom? The main thing is that they are also anti-Plato”. But for the Khimki activists, who you united with, and why, was a matter of principle. Their main aim was to create their own union. 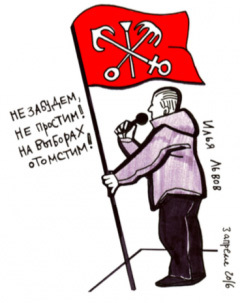 “Our union will be like socialism inside a democratic society”, was trucker Mikhail’s description of the future organisation. 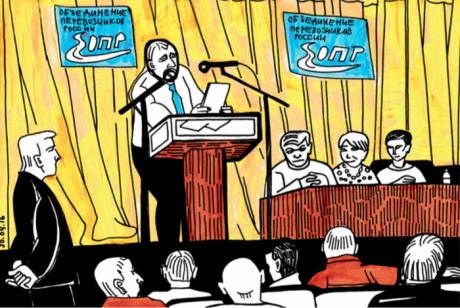 On 30 April, at the Lenin Collective Farm near Moscow, the Khimki activists held the inaugural congress of the “Association of Russian Transport Operators”. According to their figures, it was attended by around 300 drivers from 31 regions. One presentation was devoted to the faults of the Plato system, including incorrect credit card charges, registration problems and the impossibility of using the system if the driver is in an area without an internet connection. Another speaker stressed the anomalous situation whereby the calculation of rates for heavy goods traffic was based on an average of 8000 kilometres travelled per year, whereas the real average was 100-150 thousand kilometres. The motion to create the new union was passed unanimously, and Andrei Bazhutin voted in as chair by a majority vote. One representative per region was then voted onto the union’s council, and the annual congress confirmed as its ruling organ. After the congress the speakers, truckers and activists who had supported them went back to the Khimki camp, which looked more festive and lively than ever before. There were too many people to fit into the “headquarters”, so everyone mixed outside. Late in the evening, as we enjoyed a modest supper, there was a feeling of both joy and sorrow. Everybody realised that it was time for the truckers to disperse – most of them were deep in debt and in their wives’ bad books for being away for so long. They would have liked to take part in Moscow’s May Day rally, but the three applications they sent were turned down on the pretext that every square was occupied. So the camp broke up on the day after the creation of the Association of Russian Transport Operators. Dozens of activists who had become friends with the truckers over the months gathered to give them a send off. The Khimki truckers left the camp in a single column, their trucks decorated with blue banners bearing the legend, “Association of Russian Transport Operators”.